Whenever we talk about making money from a blog, AdSense is one of the top blog monetization programs. But the question is that “How many times you have applied for Google Adsense account? And does your Adsense account get approved? Or you are still struggling to get an approval from AdSense? If you are a newbie in blogging then chances are that most of you get rejected by google and some of you might get dishearten by this rejection. But don’t worry because there are many other alternatives for Google Adsense. Although there is no real alternative to google Adsense but it's always better to something than nothing. If you are also among those who are struggling to get Adsense account or you get ban by Google AdSense then you use these following networks to monetize your blog. Display Ads: Display ads contain images, headlines, body text and other elements used to get a viewer’s attention. They may be vertical(sky scraper), horizontal(leatherboard) or square. In-Text Ads: These style of ads popup when you hover over selected text phrases with your mouse. A small box pops up and usually contains either image, text or video as well as the ad’s link. Banner Ads: These are your typical image ads you see on many sites. They can be just the image or an image with a text line above or below it. Sizes range from button size to half page and come in all orientations. Media.net is the direct competitor to AdSense, powered by Bing and Yahoo. It is a contextual Ad network and it offers high-paying ads. The Ad type on Media.net is similar to AdSense, and the good thing is that you can simply customize ad units that fit to your site look. Their ads also supports on Mobile and tablets. If you have a nice blog having quality content and good traffic then I will suggest you to simply go for Media.net. Propeller Ads network is running one of the best and fast-growing ad platforms ever. Propeller Ads give the opportunity to publishers to increase their website’s daily earnings with a nice and high CPM rates. If you have traffic from US, Canada or UK, this ad network will work great for you. Being a publisher of Propeller Ads, you have access to wide range of advertising formats like banners, on-click ads, in-banner video, sliders and sponsored links. Again you have to decide which format works well for your niche. Revenue Hits is a fairly new ad network and looks very promising. They are also one of the good alternatives to AdSense. They offer both contextual and geo-targeted ads. They are a performance-based network (CPA), not a CPC or CPM network, this means you get paid when a visitor takes action. So make sure you understand that you are paid when a visitor to your site takes specific actions instead of being paid when they click on an ad. Revenue Hits has the vast inventory of ads comprised of effective text and display ads that promotes performance based offers. You are not allowed to placed their ads where there is not content. Revenue Hits offers payment via wire, PayPal and Payoneer. The current minimum payout is $50. Bidvertiser is a cost per click ad network that also offers conversion incentives to publishers.It is an online advertising platform that presents a unique way of advertising which is their bid system, the bidding system gives the publishers the possibility to earn more money from their ad slots. Initially, you won’t be able to earn much revenue as it takes some time to get your site found by Highest bidders, so you have to stay longer to get better revenue.The good thing about Bidvertiser is that you can see the current Bid of your Ad Unit. They have Text ads, Banner ads, Mobile Ads and slider ads and the good thing is that you can put as many Ad units as you want (more Ad Unit more revenue). The minimum payment amount is $10 for PayPal/Payza and $50 for a check. We all know Amazon and they are the World’s largest E-commerce company. They also have world’s largest affiliate program but besides this, they also have an advertising program named “Amazon Native Shopping Ads”. Amazon has three type of Ads i.e. Recommendation Ads, Search Ads and Custom Ads. It shows ads based on your selected categories and your blog contents. If your blog/website has the majority of US or UK traffic and you also write product reviews, then Amazon Native Ads are the best choice for you to earn good money. Infolinks is a bit different from other advertising networks. It’s an in-text advertising program. They show ads that are matching with your site content. Infolinks converts certain keywords from your site content into advertising links and you are paid for each click made on those ads. They are one of the largest ad monetization networks in the world today and has been a successful network with more than 200,000 online publishers in over 128 countries.The best way to boost your income from Infolinks is to not to put more links on one single page, try to limit them to 4 to 5 links per page so that your content will look natural and not a link spammy content. If you have a quality content then definitely you will get great results. The good thing about Infolink is that you can use it along with Google Adsense. Infolinks has four type of Ads i.e In-Text, In-Fold, In-Tag and In-Frame. Their minimum payout is $50, and they pay through PayPal, wire, and e-check. Adversa﻿l is one of the best alternatives to Adsense in terms of serving ads. If your site gets over 50,000 page views per month then you can apply for Adversal. They have fast approvals but make sure your site meets their requirements before you apply to be a publisher. It takes 3-4 days to get your application approved. They have great CTR and works with several languages. They offer various banner sizes and types to publishers. Pop-unders and ministitial type ads are also available for publisher use. They support Paypal, wire transfer, and ACH and their minimum payout are $20. Adversal is also one of the few ad networks that also have an affiliate program. First of all, BuySellAds are not for those who are already struggling to get their site approved by Adsense. If you get banned by Adsense then you can opt for BuySellAds. You need at least 100,000 monthly site view to get approval from BuySellAds. They work differently than other networks because they don’t work on CPC or CPM. They just work as a middleman between the Publisher and Advertiser. When you submit your blog or website to BuySellAds for approval, they will look at your PageRank, Alexa score, inbound link count and other metrics to determine your site’s overall quality. Again it's not easy to get approved by BuySellAds but it’s a good alternative to Google Adsense. With over 32,000 affiliate merchants VigLink is totally different Adsense Alternative. VigLink automatically converts your site’s normal link into an affiliate link. If someone makes a purchase through your affiliate link then you will earn commission from that link. This affiliate network works best if you write about products. Suppose if you write about Gear Watch and someone clicks on your affiliate link and make a purchase of that Gear Watch then you get a commission out of it. VigLink is paying through PayPal and their payment threshold is $10. They pay you commission between 25% to 50% depending upon the product. With more than 350,000 publishers Chitika is serving more than four billion targeted ads per month. The best thing about Chitika is that they allow you to customize your ads and they work very similar to Google Adsense. Chitika ads are search targeted, this mean they work best with sites that get most of their traffic through search engines. You can use Chitika along with Google Adsense. Chitika pays through paypal (minimum $10) or via check ( minimum of $50). Chitika is one of the few ad networks that has an affiliate program. This could bring in an additional income for you. Skimlinks is similar to Viglinks. It converts your outbound links into affiliate links, and you can earn money whenever a sale is made through your affiliate link. It is integrated with thousands of affiliate link programs so you don’t have to join them individually. You just have to join Skimlinks and the rest of the work will be done by Skimlinks. Skimlinks is good for e-commerce based sites. You can be paid through PayPal or via check. Adsterra is a premium advertising network serving over 10 billion geo-targeted ad impression per month. It offers highest CPM rates with global coverage. It has display banners, Popunders, direct links, sliders, push up ads etc. Publishers can receive their payments on time via Paypal, Bitcoin, Payoneer, WebMoney, Wire Transfer, Paxum, and Payza. Adsterra works with websites from all types of niches and have a great ad fill rate for all countries. They are a perfect alternative to AdSense. Adsterra also offers a 5% Referral program. Qadabra is a self-serve ad platform that offers performance-based advertising. Formerly known as AdsGadget, Qadabra is one of the best Google AdSense alternatives. Qadabra requires no wait time to be approved. If you are new in blogging and not getting much traffic then it is a great ad program to start with. You can start using Qadabra in just a minute. You just need to Sign up, get the code and start making money with it. With Qadabra, your ads appear immediately. The ads are nice, and they also offer rich media including an option for popups. Qadabra supports international traffic with great fill rates and you can get paid for the very first dollar you make which is the best thing. It is a great community to be a part of, as their support team is always there with tips on how to earn more from your site. The best thing about Adsense is that it pays a good amount. Beside this other alternatives don't pay such good amount. If this is the case with you then don't worry. With AdsOptimal you get good amount.They show high quality ads on your blog. If your blog have good traffic then AdsOptimal is a good choice. Formerly known as Gloadmarket, Adonly is the good, simple and easy to use advertising ad network. It helps website owners make use of any position to sell ads, especially those that will be hard to sell directly to maximize their profit. The ad formats consist of the rectangle, leader-board, skyscraper, banner, layer ad, pop-up, pop-unders, and slider formats. Adonly supports multiple payment options and they pay three times a monthly in date 10, 20 and 30. And the minimum payout is $10. Clicksor is an ad network that provides inline text links, text banners, popunders, graphical banners, interstitial ads, etc… those type of ads made the choice to advertisers to choose a great and large variety of advertising options. For publishers, Clicksor seems to be one of the best ad networks that make more money with their ad types. The minimum payout is $50 and will pay you through Paypal, check, bank and wire transfer. Previously know as Lijit, Sovrn ad network is a less known ad network than other companies. Sovrn gives the ability to publishers to track their earnings with advanced reports tools to maximize their revenue from worldwide traffic. They are a CPM-based Ad network.The minimum payout of Sovrn is $25 through Paypal/ check and wire transfer. eDomz is in the business of ad networking since 2005 and providing traffic to advertisers. Their advertising solution provides contextual ads that make sure that relevant ads are being shown to your visitor. Contextual ads help you getting more clicks and hence increase conversion rates and earn you more money. They pay out 70% revenue share to the publisher. eDomz provides 2 types of ad formats- Pop-Up/Pop-Under and CPM/CPC ad banner. For using both types of ad formats, you have to create separate accounts for each ad format. The minimum payout is $10 through Paypal/ Moneybookers and Payza. Pulsepoint (formerly known as Contextweb), is a reputable CPM ad network that performs well for low and high traffic websites alike and does not require clicks to earn revenue. 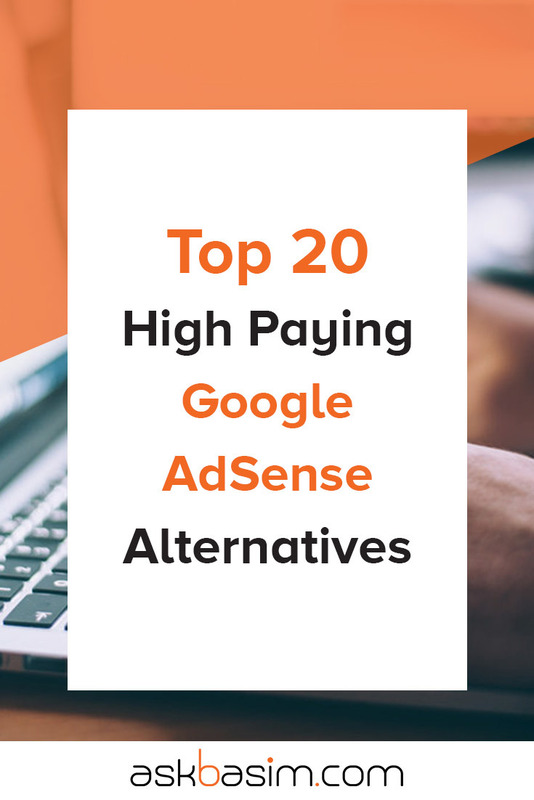 It is a great alternative to google Adsense that enables good ad types. The problem with Pulsepoint is that they don’t provide high fill rates ( 50% ) but if you have a good website with high traffic that's fill rate will be nice to you. Pulsepoint accepts any website including new blogs with low traffic. They support Paypal, Check and Wire transfer and the minimum payout is $50. The network is the brainchild of a successful company known as Yesup media inc which has an already established online and offline presence in the world of advertising. YesAdvertising provides a data-driven environment for advertisers to promote their products or services in the most effective method possible. By leveraging big data to optimize your campaign, their system tracks specific actions that have been taken by visitors once they have engaged with an ad, bringing a complete picture of your ad’s performance. They offer standard ads, expandable ads, interstitial ads, pop-under, pop-up, corner-peel ads, wallpaper/skinning ads/background ads, push-down ads, footer bar ads, sidekick ads, upper bar ads, floating ads, in-text ads, native ads and text ads. The minimum payout is $10 through PayPal, Payoneer, Check, Wire and Bank Transfer. Using multiple publisher networks at the same time on your blog/ website will slow down your blog. I will suggest you not to use more than two publisher networks at the same time as this will slow down your blog speed. It's always better to do A/B testing among multiple publishers and check which one works best for your blog and helps you make more money.